Designed to give you quiet confidence during power outages, the Q6500 QuietPower Series inverter generator is more than 60% quieter than a standard generator and can deliver 6,500 starting watts of reliable home backup power. The inverter generator technology of the Q6500 supplies consistent power for essential home appliances, including sensitive electronics. 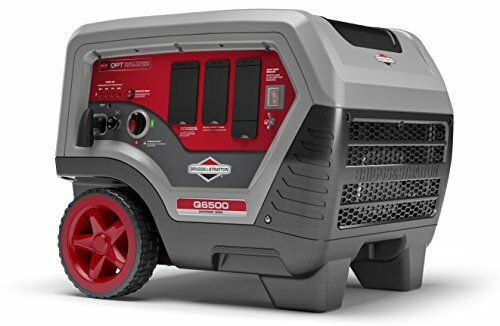 The portable generator features a highly-efficient integrated engine/alternator that provides up to 14 hours of run time at 25% load. A protective, noise-reducing shell minimizes noise and protects internal components while enclosing the all-steel frame. 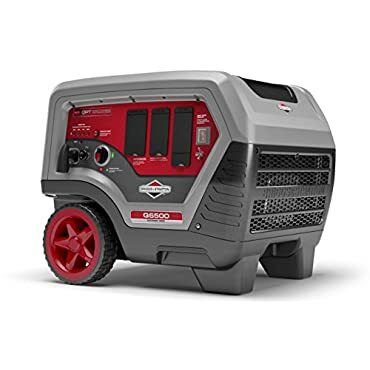 With a design that's 45% more compact and 30% lighter than standard generators, moving and storing your portable generator is no hassle. Plus, a suitcase-style telescoping handle makes it easy to maneuver around your garage and property. The Q6500 allows you to power a wide variety of electronics and devices at the same time with 120V-20A outlets (4), USB outlets (2) and a 120V-240V locking outlet. Use of an RV adapter in the twist lock outlet, provides 120V / 20.8A (half) of the total available power. Backed by a 24-Months Consumer and 12-Months Commercial Limited Warranty, the Q6500 can be serviced at one of Briggs & Stratton's 10,000 service dealers in the United States. Briggs and Stratton 6.5KW Inverter 30675 New -- Authorized Seller. Full Warranty. Money Back Guarantee. Briggs & Stratton 030675 QuietPower Portable Inverter Generator 6500 Starting Wa -- Jegs ? Selection, Value, Lifetime Support Since 1960? Last updated: April 20, 2019 at 11:25 EST. Pricing information is provided by the listed merchants. GoSale.com is not responsible for the accuracy of pricing information, product information or the images provided. Product prices and availability is subject to change. Any price and availability information displayed on amazon.com or other merchants at the time of purchase will apply to the purchase of the product. As always, be sure to visit the merchant's site to review and verify product information, price, and shipping costs. GoSale.com is not responsible for the content and opinions contained in customer submitted reviews.